This is to my knowledge the only diary/journal from the 30th Foot in the Peninsular war and is therefore very significant. I discovered the diary of Ensign John Carter in the West Yorkshire Archive Service based at Leeds and with their help I obtained a photocopy to work from. This battered and stained little booklet in a difficult hand, is in a very poor condition and I am glad that I have been able to transcribe its contents for future generations before it becomes impossible to read. I must thank the staff at the West Yorkshire Archives, not only for their help unravelling certain words that were very hard to make out, but also for liaising with the current owner of the diary Lieutenant Colonel H V Dawson, who very kindly granted permission to publish it. John Carter was commissioned as an Ensign in the second battalion of His Majesty’s 30th (Cambridgeshire) Regiment of Foot on 7 March 1811. Like many of the young men who went to the Peninsular war, John carried a small note book so that he could record his travels and adventures. He presumably started recording his adventures from the moment of sailing to join his regiment. Unfortunately if he did, this initial diary does not seem to have survived. We therefore join him having travelled out to his battalion on 24 November 1811 when his regiment, which formed part of the 2nd Brigade of the 5th Division retired from the frontier, deep into Portugal to take up their winter quarters. 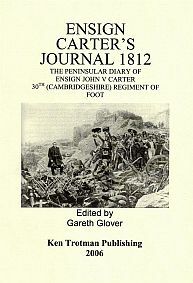 John Carters diary only covers the period of 24 November 1811 to 7 March 1812 and he does not describe any fighting, his regiment not being engaged during this period. This may lead one to conclude that it is therefore of little or no importance, however that is indeed far from the truth. In fact John Carter was a particularly keen observer of incidents which he describes in a style full of vitality, wit and urbanity. One must also suspect that John never intended this for anything more than his own personal pleasure, for the language and honesty he uses would make it uncomfortable reading for family and friends and certainly could never have been published! The great historical value of this little work is the very full picture it portrays of life as a junior subaltern officer in a regiment at this time. He lists the numerous court martials which he attended, the offences and punishments intermixed with the gregarious life style of a young officer and his numerous escapades. There is also much regarding the regiment at Ciudad Rodrigo, the 30th arriving there immediately after the successful siege, Charles being a witness to the Light Division leaving over laden with treasure, the burial of Craufurd and being fully involved in the rebuilding of the defences, on which he has much to say of interest. This diary is a delight and its only disappointment is that it is so short, for it stops on the road to Badajoz, a siege in which the 30th including Charles, were fully involved and the loss of his words on this siege are undoubtedly a tragedy. Presumably he continued his diary in another book, but unfortunately this has not survived possibly buried with poor John Carter when he succumbed to the rigours of campaigning in Spain. He is recorded as dying of sunstroke at a depressingly young age at Ciudad Rodrigo 23 July 1812.